Are you an iPhone 5S person or an iPhone 5C person? As has become tradition in Apple kremlinology, techies have spent the past week trying to decipher what the "C" and the "S" stand for in Apple's new smartphones, the iPhone 5C and iPhone 5S. Guesses both serious and sardonic for the proudly plastic, kaleidoscopic "C" include "cheap," "color" and "Chinese"; common wisdom says the "S" stands for "sensor" or "scanner" or "security." My editor, however, had a different idea. "Maybe C and S stand for ‘Class Struggle,'" he joked, after aggregating a list of dozens of Twitter users who had deemed the iPhone 5C "for poor people" after its unveiling. Sure as the iPhone 5 fades into obsolescence, Apple devotees know they're going to need new phones: the iPhone 5S or the iPhone 5C. What's less clear is which one. We could start retabulating the virtues of each one, but why bother? No one really needs help choosing between Apple's "forward-looking" 5S and the "colorful" 5C, both of which go on sale Friday. Rather, put it this way: If you think you need help deciding — if you just want one more perfect article comparing the specs of the two phones — then you've already secretly decided: You're a 5S type. Because 5S people love specs. They like to read about the 5S velocity, as speed-demons in earlier days might have shopped for Porsches. They savor the new camera numbers as if they were Diane Arbus, needing levels of pixelation not seen in nature. 5S people pore over and memorize the iPhone spec lists just so they can savor the glories of their pricey new phones in advance, and drop in pixel density and contrast ratio counts during early autumn dinner conversations. By contrast, 5C types only ever needed one spec: $99. The 5C crowd are people who till now considered iPhones either out of reach or overly precious. It makes sense that Apple has cast these 5C types as colorful — the multihued not-quite-middle-class identified with Rainbow Coalitions and, internationally, with the United Colors of Benetton. Moreover, 5C types are those of us who are happy with our iPhone 5 and, heck, our 4s or 4 or 3GS, too. We wish we didn't have to upgrade at all. We may even have been casting glances at the Apple off-ramp. So we're not going to get back in with Apple with the spec-manic 5S only to make the jump, months from now, to an HTC One or a Galaxy or to some other heretical artifact that wasn't even designed in California. We are willing to put up with the infantilizing colors, with plastic phones that look like teething toys, in order not to be the dreaded spec people: pontificating to anyone who will listen about the speed and security of the 5S, conspicuously waving it about on the subway and in meetings, fingerprint-unlocking their devices not because they have anything to do on their phones, but because they enjoy the novelty, and the prestige. Oh, but this sounds chippy. See what Apple has done? With its two phones, it has created a world where you either have to be a colorful clown — do I amuse you? — with that iPhone 5C, where you have to sign on to the fun of frugality; you can't just have a cheap phone that says, "This is all I can afford," which at least has some dignity to it. At the same time, with dippy 5C, you renounce your right to be "forward-looking": an early adopter of the faster phone. Instead, you're upgrading — to a backward phone. And through your happy clown smile, you have to pretend you're not missing out! That you couldn't care less about the amazing, eye-popping camera or the hushed Jason Bourne palate of the muted, sophisticated thoroughbred, the iPhone 5S. But if you get the 5S — well, you're the chick who had to have the best. Because her texts are world-historic and can't be left to slow, insecure phones. Or the gaudy plastic of her tartier 5C sisters. This is how they divide us, these massive tech companies. How they create the illusion of an identity choice: print or e-book; high-def or standard; pro or free; s or c.
Maybe in this mobile cycle, you could ask yourself what you need more of right now: money or specs. If you're going Apple, let the money/specs question guide you to the 5S (specs) or the 5C (money). And then just be quiet about it. Don't overthink; don't regret; and don't begrudge anyone else his choice. You may have bought in as a clear, confident act of self-expression, but that conceals the fact that you're just buying — and from the same company, for Pete's sake. 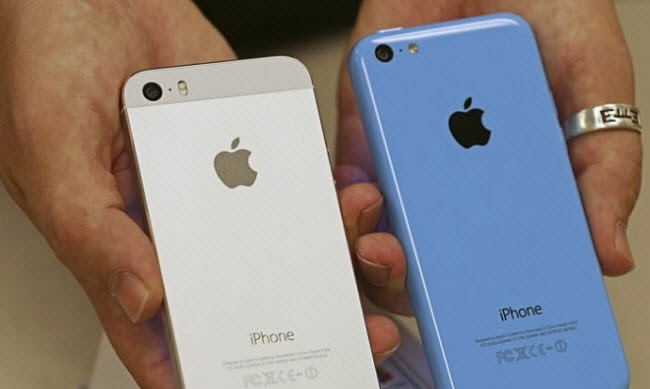 Apple's iPhone 5S and iPhone 5C – Innovation or Imitation?